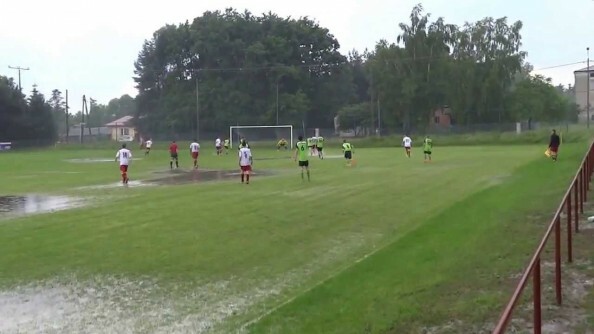 There really aren’t that many ways to make goal-celebration seem original, but if you’re playing on a pitch with no draining system, you can water-bomb into a puddle, just like players from the Polish football team GC United Gassy did in their match facing Grom Prace Małe. Gassy lost the match 2-1, playing during a thunderstorm, enjoying a consolation goal from Trykacz Jarosław, who wasn’t too fanatic about the celebration of the goal. However, his teammates were a little bit more excited, as one of them preformed the cannonball straight into the puddle of water and mud, causing somewhat of a chain reaction, as two more players decided to get dirty themselves, doing the swan dive, or Klinsmann dive as it is known to some, straight into the disgusting water to the enjoyment of the few fans surrounding what looked more like a cattle grazing field.